I am loving working with primers when I style my clients curls! I used to go straight for the styling products because I felt that the hold was diluted if I put a primer in first, but after attending the Art of Curl Class by Ouidad last month, I was re-inspired by styling and working with all the different products Ouidad has to offer. As a curly hair specialist, it is hard for me to be a client because I know exactly what should be done to my hair. Since I can't reach around my head and cut my own hair using curly hair cutting techniques, I am at other stylists disposal! Hi there Curlies! I have a tip for you in today's video. It's a naughty no-no for our delicate curls, but it helps me feel polished and a little more 'done' in times of a special occasion / event (just in time for the Fourth anyone!? ), or, in this instance, when nothing I do looks good in this humidity!! Can you say it's time for a deep treatment maybe!!?? Good luck and let me know how you do and whether you like it! Stay tuned for more styling videos. Til then, you can check out my previous ones on my youtube channel. 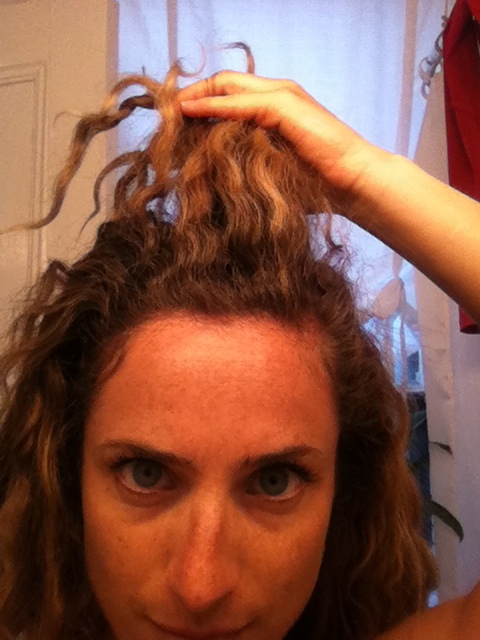 Hair: Humid Hair Help for Curly Girls! Holy Humid Hair Hideousness this past week! What was up with the moisture in the air on the Cape? It's May, not July, weather! This humidity wasn't like the heavy blanket we get in the dead of summer, oh no, it was more like the 'marine layer' we used to get when I lived in L.A. ~ just severe moisture build up and fog, which is essentially like standing in a steam room just cringing, waiting and knowing that your hair is growing and unbelievably frizzy. I sometimes refine my curls with a curling iron in situations like these (shhh, don't tell Ouidad) which I will show you in a future video someday soon, but this time I relied on my 'do I used while in the caribbean this past winter. It's super easy and can look quite polished, trendy, cool, or edgy depending on how you spin it. It's really just a bun, but a curly bun is always cooler! The key is the deep side part! Take your side part starting at the middle of one of your eyebrows and draw a line straight back. Now, part your hair. You've just created a new part with the underlying hair on top of the frizzy stuff. Here is one of the only times you will comb your curls with your fingers, pulling and smoothing it into a low ponytail. You can rock it a little to the side at this point, and kind of pull on the crown area to give it a little bump and edge, and let the pony come over your shoulder. You could even braid it into a boho style, or you can make it look like a textured bun like I did. Just coil the pony around the hair elastic and pin with bobby pins to secure. You can finish it more so by smoothing some pomade or serum over the surface to lock down that halo of frizz! Ouidad's clear control pomade or frizz fighting spray work great! The cool thing about curly hair is that all the texture that's in there looks like a set that a straight girl would have to work hours to achieve with a blow dryer and curling iron. This look literally takes about 1 minute. Put on some bold earrings and doll up those eyes, and you're good to go. I'm sure I'll be relying on this one a lot this summer, and I hope this helps you too! 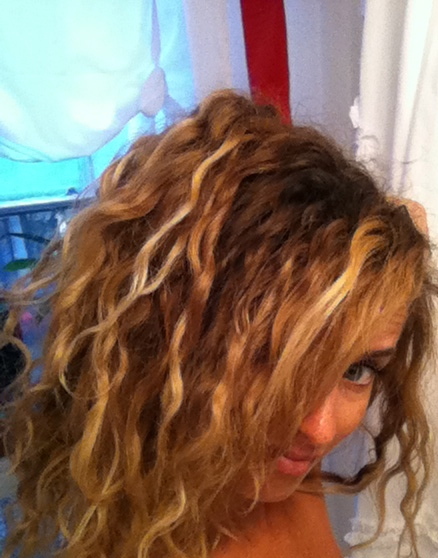 For more Curly Girl Cures, click here. 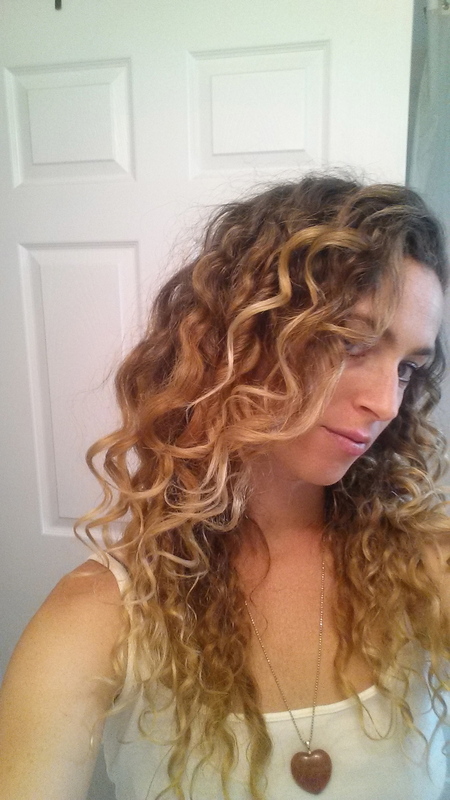 One of the biggest questions I get from my Curly girls, is how to get as many days out of your curly style. For me, I can get a good 5-7 days (just don't get too close to smelling my scalp towards the end;). I have lots of little 'preserving' tips for curls that I want to share with you when your days call for running, getting your yoga on, humid weather, etc., or basically anything that starts to get in the way of you and your styling armor! First things first, you MUST master the Rake and Shake styling...that's what's going to get you the long lasting results that you desire! I also suggest diffusing the hair initially, because the heat locks in the set that much better! Secondly, make sure you're sleeping and showering correctly. To refresh, check out the top video, where I talk about 3 different ways you can spruce up your curls, whether you need to encourage the curl pattern and just reactivate your gel, or whether you need to add a little shine, or whether you need to modify your curl pattern set with a little water and gel action. 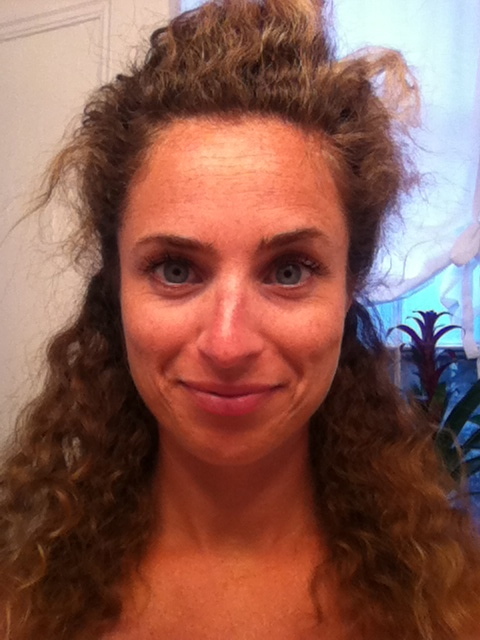 To reduce frizz / risk losing your curly style, make sure you control your sweat sesh in your yoga class, or when you run or work out, by checking out this crazy video of me post yoga class in the bathroom at my yoga studio ;). I reduce the sweat (which would wet my hair and break up my gel) by keeping my hair 'contained' in a bun with a wide headband around the hairline, and then I shake it out and apply the above tips if need be. I hope you find these tips helpful! Please feel free to share your curly cures in the comments below! I have this conversation often with first timer's in my chair! The curly clients are always the most guarded, most sensitive, most skeptical. They either finally come in after hearing about me or my curly services months or even years ago, or they come in on a whim after seeing a fellow curly on the street looking fab, raving about how it is a 'life changing experience' and ohmygosh they book straight away! Either way, they don't know what they're in for, but there is lots of work to be done psychologically between us. The consultation is the most important part of what I do and so it is SO important for me to really listen to my client's frustrations, wants, needs, likes and dislikes. I know, because I was once a curly client myself, so I try to really come down to their level, knowing that in my own past experiences, the stylist had their best interests at heart, not mine. So it begins...we consult, I pull and push and try to drag out everything I can. They have huge walls up! But when we're finished, they truly are over joyed. I can't over promise that this will always be the case (some people are just not happy on the inside, so anything done on the outside will just be temporary) but more often than not, they are officially part of the 'curly club'. Many clients have been getting keratin treatments or blow drying and flat ironing before they come to me trying to embrace their curls. This is happening a lot right now because of the humidity we're having on Cape Cod. They feel it's time to let their curls come out, but they don't know what that really entails ~ It really involves getting comfortable with seeing yourself with curly hair!!! Most people feel they look bigger (face is fuller, head is wider, overall body is bigger) when they wear their hair curly. Can I just tell you, it's a law of proportion that you actually probably look smaller when you wear your hair fuller because the contrast of fullness around your face, frames it to make your face appear slimmer....meditate on that for a second! The other problem is that most curlies are used to running their fingers through their straightened hair, so when they start handling their curls, they are playing with it too much creating frizz and flyaways. Keep the hands out of the hair ladies! The big problem ~ they don't realize that you actually have to take the time to STYLE it. I always tell my clients that we do not wash and go like we'd all love to...you have to take at least 5 minutes to position your hair by doing the ouidad rake and shake styling, or some version thereof. If you were to wear your hair straight, you would take the time to use a blow dryer and a brush and possibly a hot tool afterwards, right? Well what if you thought you could get the same results by just flipping your hair upside down and drying it with your hands? Obviously, it wouldn't come out the same...That's essentially the same result you would get if you didn't take the time to position your curls by raking and shaking...invest a little time initially, and you will get a few days out of it. Watch the videos here. You just don't get the same compliments and attention being straight! Curly is cool! Curly is fun! Curly is youthful! So own it! It's what you were born with, so embrace your true essence and realize that your little curly soul is sensitive and you just need somebody to hold your hand through the process...watch my videos or come see me for a little TLC or a styling lesson.